“It is sad to see that all that remains of it is just a road sign”, sighs Yunos Osman about the village of his birth, where he lived for the first three decades of his life. The sign bears the name ‘Kampong Wak Hassan’, now a 150-metre stretch of road named after the village and except for that there is indeed little to remind us of Yunos’ kampung by the sea. The seawall at Kampong Wak Hassan. This kampung was one of several coastal villages situated along a stretch of Singapore’s northern coastline along what is today Sembawang Road and southeast of Tanjong Irau, at the mouth of Sungei Simpang. The oldest of the villages, Kampong Wak Hassan, has a history that goes back to before the 1920s, when it was moved to the area. The village had its origins in a coconut grove established in 1914 by Wak Hassan bin Ali, who lent his name to the village. Located where Sungei Sembawang had originally spilled into the Johor Strait (just west of what today is Sembawang Shipyard), it was relocated during the construction of the huge British naval base along the northern coastline (the base was to stretch some 6.5 kilometres along the coast from Woodlands to Sembawang). Kampong Wak Hassan, photo courtesy of the National Archives of Singapore. The village was also the area’s longest surviving one, cleared only at the end of the 1990s. For Yunos, who left it in 1994, and other former residents, the attachment they have to the area is still strong. Many return from time to time to sit by the former village’s sea wall. A narrow strip of public land between the road and the wall serves as a place where bygone days can be relived. Most of the village’s former residents now live in new kampungs, public housing estates with modern amenities. Another former resident and descendant of the village’s founder, Yazlyn Ishak, enjoys the convenient aspects of her new home. However, despite the conveniences they now enjoy, many would have preferred to not trade the days when the sea was their playground, when they woke to the sight of fishing boats returning to waters coloured by the sunrise, when their doors did not have locks, for the urban world they now live in. New luxury housing development in the area. For both Yunos and Yazlyn, who moved to Yishun in 1987, it is the ‘kampung spirit’ that set village life apart from their new environment. Yazlyn’s fondest memories are of the times the village came together during preparations for festive occasions and weddings. The sea wall, now partially collapsed, is a physical reminder of their former home that both Yunos and Yazlyn hope will remain. The area is currently in the throes of redevelopment and the sea wall is the only remaining physical part of the kampung. On part of the land where the kampung once stood, a luxury residential development has already taken shape. 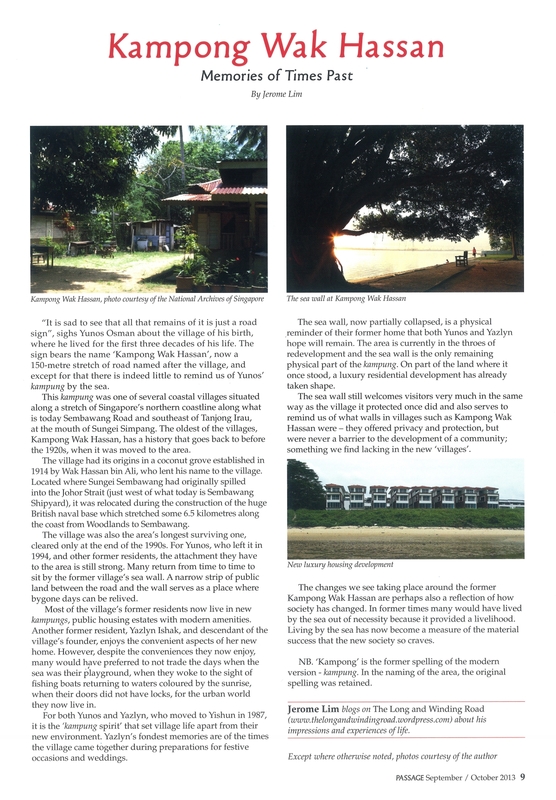 The sea wall still welcomes visitors very much in the same way as the village it protected once did and also serves to remind us of what walls in villages such as Kampong Wak Hassan were – they offered privacy and protection, but were never a barrier to the development of a community; something we find lacking in the new ‘villages’. The changes we see taking place around the former Kampong Wak Hassan are perhaps also a reflection of how society has changed. In former times many would have lived by the sea out of necessity because it provided a livelihood. Living by the sea has now become a measure of the material success that the new society so craves. NB. ‘Kampong’ is the older Malay spelling of ‘kampung’, usage of which has been retained in place names. This article was published in the September/October 2013 edition of the Friends of the Museums bi-monthly magazine, Passage (see link). A view of The Bench through the rain with the colours of the rising of the sun in the backdrop at 7.06 am on 9 July 2013. The Bench is very much a part of the scene along the top of an old seawall that used to belong to Kampong Wak Hassan at the end of Sembawang Road. That it is there, under the cool shade of a tree, is a mystery. Nobody does seem to know why it is there or who it had belonged to. It does serve to connect us with the kampong (now spelt kampung) or village which might otherwise be forgotten. The village was one of the last of the villages which one featured across much of rural Singapore to be cleared in 1998. More information on the village can be found on a previous post Monoscapes: Kampong Wak Hassan beach. The beach along the seawall is also one of the last natural sandy beaches left in Singapore and serves as a welcome escape for me from the overly urbanised landscape of modern Singapore (see: The song of a forgotten shore). For me, one of the most difficult things about being at home in Singapore is how little there is of what ties me to it that I can hold on to. The Singapore of today is one which bears little or no resemblance to the Singapore I grew up in, and one which I am very much attached to. I often find myself overcome with that sense of longing and sadness that accompanies a realisation that I can never return to that Singapore I fell in love growing up in. I find myself wandering through many of the altered spaces, in search of the little reminders that remain of those times forgotten, often leaving only with regret. Many of these spaces, now devoid of a way of life it once supported, are empty except for the clutter of ornaments inherited from the modern world. There are but a few spaces which have been spared this clutter. It is in the echoes of these spaces left without their souls, that I sometimes hear the singing of a song the lyrics of which might once have familiar. A familiar tune is still heard along the northern shores. Spared thus far from the interventions the modern world is too fond of, it is where the memory of naturally formed beaches, now a rare find, has been preserved. It is where perhaps a memory of a way of life we have forgotten can also be found in the casting of nets and rowing of sampan–like hulls. Alas, the familiar tune may soon be one we are to forget. The advance of a world in which it is hard to find sanity, has reached its doorstep. We see swanky beach front units that reek of the smell of money sprout in an area in which the smells would have been that of seawater soaked wood, of fishing nets drying in the sun, and of the catch from the sea. For how much longer will I be able to hear the familiar tune in my ears, I do not now know, but it is a tune I am determined to try to hear for as long as I am able to. The beach in the photographs is one of the last natural stretches of sandy beaches left in Singapore. It stretches from the seafront of Sembawang Park eastwards past the seawall at the former Kampong Wak Hassan and past the seafront area of the former Kampong Petempatan Melayu or Kampong Tengah, where it is broken by the mouth of a diverted and canalised former tributary of Sungei Simpang, Sungei Simpang Kiri. It would have run further east towards Tanjong Irau at the mouth of Sungei Simpang – that area, currently used as a military training ground and is inaccessible, is a reserve site for public housing and will be the future Simpang New Town – the coastline of which will be altered by land reclamation based on the Urban Redevelopment Authority (URA) Master Plan 2008. Kampong Petempatan Melayu or Kampong Tengah was a Malay Settlement which was established in the 1960s on some 16.5 ha. of land acquired by the Government from the Bukit Sembawang Group. It was a group of three coastal villages just east of the Naval Base which also included Kampong Tanjong Irau to its east and Kampong Wak Hassan to its west. A mosque, touted as the “last kampong mosque in Singapore”, the Masjid Petempatan Melayu, was built in Kampong Tengah which still stands today, despite the disappearance of the village. Coming a full circle, the land fronting the beach is currently being developed by the Bukit Sembawang Group as a luxury development, Watercove Ville which will see some 80 strata houses built, and in all probability, the beach and beachfront will soon have to be made over. What is possibly one of the last natural accessible stretches of sand along the coastline of the island of Singapore lies along the northern shoreline off Sembawang Park, stretching to the area off the former coastal villages of Kampong Wak Hassan and Kampong Tengah. Except for the attempt to “renew” the area around Sembawang Park which will result in it losing much of its previous charm, the shoreline in the area is one that is relatively untouched. Left in an almost natural state, the beach is one rich in character and in which the memories of a world that has ceased to exist can still be found. With property developments gaining pace in the area, it probably will not be long before the memories provided by the old but falling seawall and the natural beach, are paved over in the same way much of our previously beautiful coastline has. Until then, it is one of the few places close to a world I would otherwise find hard to remember, in which I can find a rare escape from the concretised world that Singapore has too quickly become. The former village (kampong or kampung as it is spelt today), was one of several coastal villages that were found just to the east of Sembawang Road and the former British Naval Base, running along the coastline to Tanjong Irau at the mouth of Sungei Simpang. 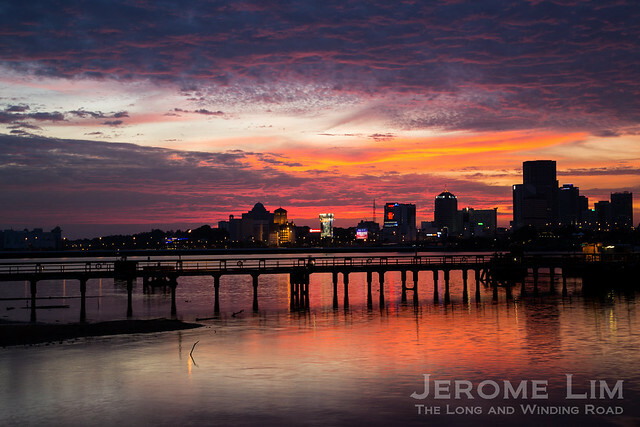 While the coastline played host to the nomadic inhabitants of the Straits of Johor, the Orang Laut, specifically the Orang Seletar, the kampong, stands as the oldest of the settlements in the stretch. The village came to the location after work to build the huge naval base which ran along the northern coast from what is today Sembawang Road west to to the Causewayin the late 1920s displaced the the original Kampong Wak Hassan which grew from a coconut grove founded by Wak Hassan bin Ali at the original mouth of Sungei Sembawang (the area just west of what is today Sembawang Shipyard) in the 1914 (being granted rights by the Straits Settlements’ Commissioner of Lands to the use of the land stretching from the mouth of the river to Westhill Estate – which became Chong Pang Village). While the base did provide residents of the village with employment opportunities, most of the villagers who may have originally been employed in rubber plantations which once occupied the lands around the coast and in the coconut groves, were involved in fishing. The village besides being the oldest in the area, was also the longest lasting. While most of the inhabitants of the other villages were resettled at the end of the 1980s, the last inhabitants of Kampong Wak Hassan only moved out as recently as in 1998.